When the Yankees hit the road it is not unusual to hear fans in the stands rooting for them against their own home team, but up until yesterday it was typically only in cities with horrid teams like the Devil Rays and the Kansas City Royals. While watching last night’s game one of the American League Division Series vs. the Cleveland Indians in Cleveland Lebron James could be spotted in the stands sporting a crisp navy blue cap with the famous interlocking NY logo on the front. Lebron eventually took his hat off before he left the game with the Yankees trailing during the sixth inning, but not before upsetting at least a few fans. 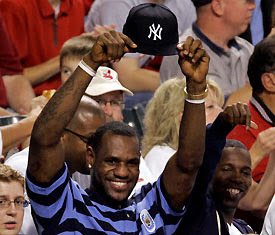 “I am done with LeBron after seeing him rooting for the Yankees and wearing their cap at the Indians game. That is the most tasteless, classless thing I have ever seen by a sports celebrity,” one fan posted on the Cleveland Plain-Dealer’s website. Weather or not Lebron showing up in a Yankees hat pissed you off or not there will be no member of the New York Knicks showing up at Yankees Stadium on Sunday wearing anything but a Yankees hat.